Bill McCallum runs a “standard of the week” contest through his Illustrative Math Project, the goal of which is to illustrate what the different Common Core standards look like in student tasks. I submitted a task for 8.4.F, linear modeling, which was accepted. It’s called “Graduation” [pdf]. My students finally understood the meaning of y-intercept as something more than “when it all began”. They also understood slope to mean rate – or how fast they read the names – rather than rise over run! I have no idea what iBooks Author will do to the publishing industry writ large or textbook publishing writ small. My hopes are high we’ll see a lot of productive chaos as well-heeled districts and non-profits finance mid- to high-quality textbooks that are then dumped at no cost on the market. Algebra, as designed by McGraw-Hill for iBooks 2, is lighter by pounds. It’s indexed for search. It’s quick. You can highlight the text and insert notes. It removes one layer of abstraction between students and tools that already existed. Rather than accessing quizzes, tutorials, and enrichment videos by loading a CD-ROM into a computer or entering a password into a website, they’re a tap away. That’s where the differences end. Students still interact with mathematics as they always have. In a typical McGraw-Hill unit, students encounter expositional text that leads into skill practice that leads into application problems, the kind of which I’ve been a noisy opponent. Apple promotes the interactivity of these textbooks but that interaction is rare and heavily prescribed. At one point, you can modify the parameters of a linear equation and watch it change on the screen. On another page, I found a 3D model of a building that illustrated some algebraic property. I could rotate it with my finger. The textbook is now digital but students still encounter it as they always have: wisdom to be received, perhaps highlighted, annotated, and memorized, but not created, constructed, or made sense of. Teachers still interact with students as they always have. 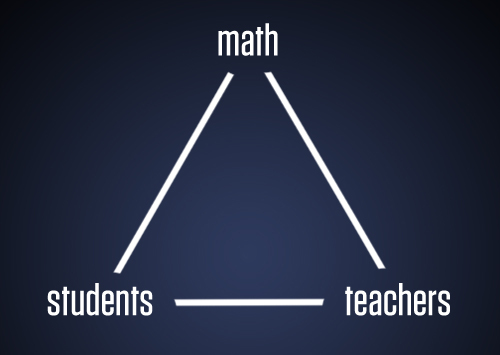 The platform doesn’t offer them any new insights into the ways their students think about mathematics. As far as I can tell, the iBook doesn’t establish any new link between the student and teacher, or strengthen any old ones. What I’m saying, basically, is that I’d have to modify, adapt, and extend the McGraw-Hill iBook in all the same ways that I modified, adapted, and extended the McGraw-Hill print textbook. We’d pull out the iBook just as infrequently as its printed sibling. The McGraw-Hill authors may not have had much imagination for the possibilities of digital math curricula. Their iBook feels like a print product, through and through. On the other hand, they may have had plenty of imagination but insufficient support from Apple’s authoring tool. I’d like to examine that question — what is possible with digital math curricula and can iBooks Author realize those possibilities? — in another post. Keith Devlin (@profkeithdevlin) invited Karim Ani (@mathalicious) and me to co-host a panel at his summit with Finland and American academics on our experience with social media in teaching. I captured it on my Flip camera and posted the video below. Keith came upon me kind of halfway through my story of social media and teaching. The start of that story was when I didn’t have professional development options. Like I started in a big district with lots of them, big professional development days every month, huge festivals of teacher learning, and then I went to this school in the foothills of Santa Cruz where there was a total of six or eight math teachers in the entire district. There weren’t a lot of options. The people I worked with — they were much more senior than me. They had already pushed past or resolved or were not interested in the issues that I was interested in and needed to learn about. So for the cost of a few cups of coffee, I went online, made a website, got a blog software running and just started writing a journal and what happened for me as a young teacher was — I’m just grateful for it. That’s my primary stance here is one of gratitude because this could have gone any number of ways. I wrote about everything I did. I’m not a bad writer so it wasn’t boring to read but people started coming around, people who were much more veteran than me, who had the same interests that I did, and essentially I found myself creating my own faculty lounge. And these people would just pepper me with criticism and flatter me with some compliments now and then if they liked it and I learned to — I figured out who was good to pay attention to, who the cranks were, that’s a key skill I had to develop. And, honestly, I have no empirical basis for this but I think I developed two years as a teacher for every one year I was in the classroom on account of all this criticism sanding off my rough edges and pivoting me away from some dead ends. You know I had my worksheet phase where I would obsess over font choices on worksheets or whatever and I had enough feedback that like “There is a limited shelf life for this.” And that was great. So pursuing this thread of return on investment — 200% return on one year of teaching is how I saw it — and there’s plenty of other ways I saw that too where I would post curricula that I had spent a lot of time on. The first big one for me was a video series called Graphing Stories where kids would watch videos and then graph elements of it to introduce two-dimensional graphing. Took me like eighteen hours over a weekend to create the thing. And it was good and productive for my class. But I posted it online afterwards and just offered up the whole thing in an easy download and 6,000 people downloaded it in two weeks. And the process gave me lots of feedback which made it better for my students. Social media for me creates this very virtuous cycle where I become more productive, get better feedback, my kids win, other peoples’ kids win. And this narrative plays out in reverse with other people who blog and me. I am that person to them that they are to me. It’s something that I’m still trying to figure out. I posted all of my Algebra 1 curricula I developed. All my Geometry curricula is just there for easy download. This is kind of the lifestyle now. I applied to give a talk for my regional math conference. You know, we have this small North California thing. Not like an NCTM plenary. It was like a twenty person thing in a classroom at a middle school but you know I put a small camera on a shelf and filmed it and put it online and just sent a note out and, you know, there’s twenty people in that room and I just checked it before I got here and 3,000 people have watched it in total. That’s passive. I didn’t do anything to pursue any of them. I just put it somewhere where it’s easily found and my message, the things I’m enthusiastic about, that I want to advocate, those get out there. And people find it. And they learn from me. And they critique me. And it’s all very, very positive. People from news organizations will contact me and ask for my opinion on this or that. I’ve seen this happen to other bloggers who have their hobby horses and they pursue them relentlessly and I see them in every single article or TV press piece on, say, Khan Academy that there is. They’re always there. And you think about some teacher in some rural area who has no impact outside of 150 kids and six teachers in their department. They can have that worldwide, national impact with social media. So see it as an advocacy thing. See it as a professional development thing. Those are my two largest frames I have on it. Can I please follow up on that [Devlin’s comment about webcasts] and ask a question out here, of the academy? I’m a grad student in my second year and I’ve never shared this with anybody here, least of all my adviser, who’s in attendance, but I don’t understand the incentive structure for what you do and what I may do someday. You write amazing things and you study amazing things and you write them compellingly in journals that are not read by practitioners very often. They affect a lot of policy, which I think is a really good, top-down approach. But then I’m over here and I can post something that’s seen by 10,000 people overnight. That’s the number of subscribers I have to my blog right now. Or any number of these things. So the incentive seems strange to me. Like I don’t understand this brass ring I’m chasing. It seems like a strange prize at the end of a finish line of grad school. So there’s the question and then there’s also the encouragement. You have so many soapboxes available to you. Find a kid like me and ask him how to do a webcast or something. You have so many — and to restrict yourself to peer review, I don’t know. There’s very little upside to me, it seems. [to my adviser] We should talk. By the time you see a paper in a journal, the field has moved on. (Loeb, 2010, lecture). 2012 Jan 22. Scott Elias started a series exploring the value and process of an education doctorate. 2012 Jan 25. Had that meeting with my adviser. I wasn’t sure how it’d play out since I kind of took an incredulous stance towards the academy in that panel. The upshot of the conversation is that she wants some help setting up a blog and she thinks I should look at some of this online teacher professional development we run here as a possibility for dissertation research. So … positive, I’d say. For me the PhD wasn’t the brass ring. The brass ring was discovering something about (in my case) the physics of the ocean from a point of view that no one else ever had taken, and convincing a bunch of people who had studied that system really closely that what I was seeing made sense and wasn’t missing anything important (as far as we could all tell at the time). Or, as Ben puts it, “Having learning as a full-time job is really, really delicious. From my vantage point, the brass ring of academia is not getting the message one already has to the most people but the search for the right message. Can they be done simultaneously? I don’t know. But, the fact that someone may have 10,000 followers does not mean that person possesses the truth. Many people read USA Today, but it’s still a crappy paper. If we could really put much stock in this research, people would look at the results and agree that XYZ works and everybody would do it, and just leave the fiddling alone, but nobody has figured out what XYZ is, other than to make sure that kids come from higher income households and that their parents care about their education. 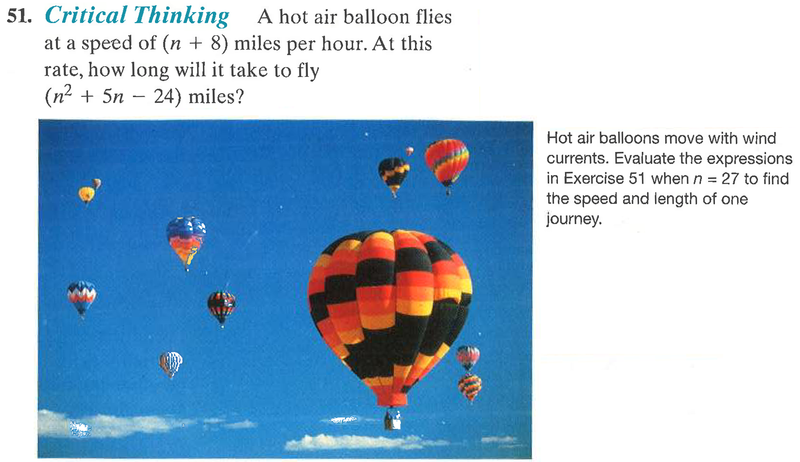 A hot air balloon flies at a speed of (n + 8) miles per hour. At this rate, how long will it take to fly (n2 + 5n – 24) miles? I love it when Nature has terms that factor so well. It begs the question, who actually writes this? The authors are all distinguished teachers and professors, many with PhDs. But would any of them stand by this? Was it handed over to an intern? Was it caving in to the “applications” lobby? Or do they consider it a good problem? The problem with multiple authors is that none of them “own” the work; none of them consider it theirs. Its a project they are working on, but they’re just collaborators. Given a choice, I will always choose a single author book. I know it will have been written with greater care. First Vi Hart. Now Brit Cruise, whose exemplary work with videos and math instruction was featured in these pages a couple of weeks ago. For me, this has all the drama of some kind of skin graft or organ transplant where no one has any idea if the host body is going to accept or reject any of it. 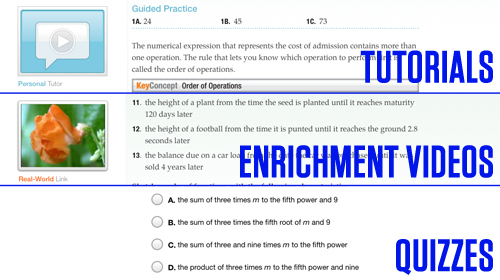 In both its videos and its exercises, Khan Academy has a distinctive house style. So does Hart’s work and Cruise’s to a lesser extent. It isn’t remotely clear to me how any of those competing styles will interact with each other. In news that’s much less exciting, though still related to Khan Academy, I’m working with my advisor and two other graduate students at a charter school in San Jose. We’re working with their teachers and Khan Academy to develop a blended unit on similarity, congruence, and trigonometry. 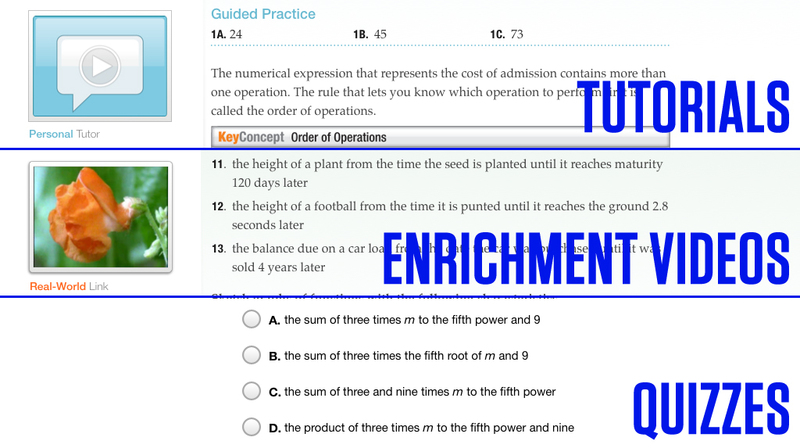 (“Blended” is defined, in this instance, as a 1:1 environment that includes regular in-class use of Khan Academy.) It’s my first in-the-classroom experience with either blended learning or Khan Academy. There’s probably a lot that should be said about the experience but I’m still learning.